Rob Reiner’s Misery remains one of the best Stephen King adaptations nearly thirty years after it first came out, and now the folks at Shout! Factory have beautifully restored the classic 1990 thriller for a new Collector’s Edition Blu-ray. But her fandom over Paul’s writing includes a dangerous obsession with the man himself, and Annie is determined to keep him as her prisoner and personal writer, insisting that he write her a new book bringing Misery back to life. She becomes dangerously possessive of him, even to the point of inflicting violence upon him to ensure he can’t leave, but Paul quickly realizes that his only hope of escaping requires him to outsmart Annie, and beat her at her own game. This was Rob Reiner’s second Stephen King adaptation, following his nostalgic 1986 childhood classic Stand By Me, and Misery was also his first and only thriller. The film presented a thematic and tonal shift in his career, following his earlier comedies This is Spinal Tap and The Sure Thing, and having just come off the massive successes of his romantic comedy When Harry Met Sally and his beloved fairy tale The Princess Bride. Because he didn’t have experience working in the thriller genre, the filmmaker revisited classic film noirs and Alfred Hitchcock’s filmography before directing Misery, and these influences shine through in the film. This is a classic thriller, that does indeed have shades of Alfred Hitchcock in its taut assembly, carefully building an incredible amount of suspense, and tightening the screw right until the final moments. The film is masterfully edited together, utilizing match cuts to up the tension during several key sequences, and using insert shots to add a sense of foreshadowing, from a closeup on a cigarette and match in the opening scenes, to a pistol being carefully positioned on a tray later on in the film. This was a very personal story for Stephen King, himself wondering how his more rabid fans would react if he took a break from writing horror novels, and he reportedly optioned the film rights to his book on the condition that Rob Reiner would produce or direct it, because of how much the author loved his adaptation of Stand By Me. The film remains chilling and almost eerily prescient in its look at celebrity fixations and fandom taken to the extreme, exploring how fans can take ownership of a creator’s work, even to the point of wanting to control that artist’s life. Much of the film unfolds as a carefully orchestrated chamber piece between James Caan and Kathy Bates, pitting their characters against each other in a tense game of cat and mouse that serves as a vicious battle of wits between author and fan. Kathy Bates took home the Best Actress Oscar for her breakout role in the film, and it’s easy to see why. She delivers a disturbing and unhinged performance as a superfan turned violent captor, with the depths of her madness growing deeper as the film goes on. It’s a searing portrayal of extreme mental illness, marked by her sudden rages, which are followed by overly insistent apologies. Annie’s prudish reactions to swearing, and her sometimes absurdly funny way of speaking, are juxtaposed with the shocking acts of violence that she commits. This is a bravura performance from Kathy Bates, and one that is still just as gripping, terrifying and impossible to look away from. James Caan is her match. Because he is confined to a bed or facing limited movement for much of the film, which was reportedly hard for him as a more physical performer, the actor relies on nuanced facial expressions to tangibly portray his character’s struggle and suffering. Not only does Misery work as a tightly assembled thriller about the battle between captor and captive, but the story could also be read as a metaphorical representation of writer’s block, and how authors can get trapped in the prison of their own work. It’s this depth of story and character that makes the film still stand up, and it remains not only of the best Stephen King adaptations, but also one of the many high points in the careers of all involved. The Blu-ray also includes two separate commentary tracks, the first one with Rob Reiner and the second with screenwriter William Goldman, as well as a pair of new and indepth interviews with Rob Reiner and special makeup effects artist Greg Nicotero, and a bunch of other featurettes. The half-hour Misery Loves Company offers a good discussion with the cast and crew as they reflect upon the production, and Marc Shaiman’s Musical Misery Tour allows the composer to talk about his score for the film. There are also a pair of vintage trailers for the film. Finally, the featurettes Diagnosing Annie Wilkes, Advice for the Stalked, Profile of a Stalker, Celebrity Stalkers and Anti-Stalking Laws bring together a forensic psychologist and a prosecutor to offer their psychoanalysis of the character of Annie Wilkes, while also discussing the pathologies that enable people to become fixated on someone and the real life laws in place to stop them. Aside from the first one, these other four pieces only superficially have to do with the film itself and feel somewhat dated in their approach, but they still provide some interesting talking points. 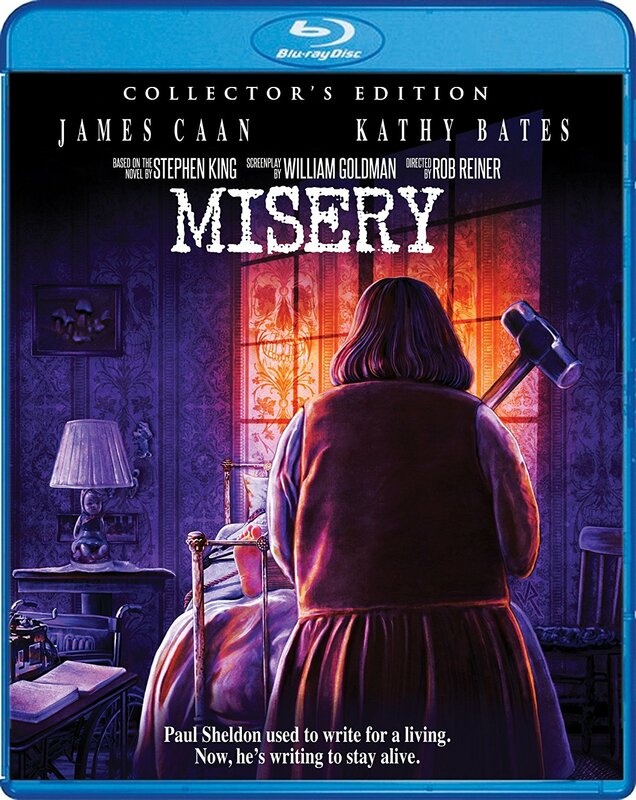 Along with the new interviews, the other main selling point of this release is a 4K restoration of Misery, sourced from the original film elements. I only had the barebones DVD before, so I was definitely happy to add this release to my collection, and it’s worth the upgrade for fans. Misery: Collector’s Edition is a Shout! Factory release. It’s 108 minutes and rated R.